Live! 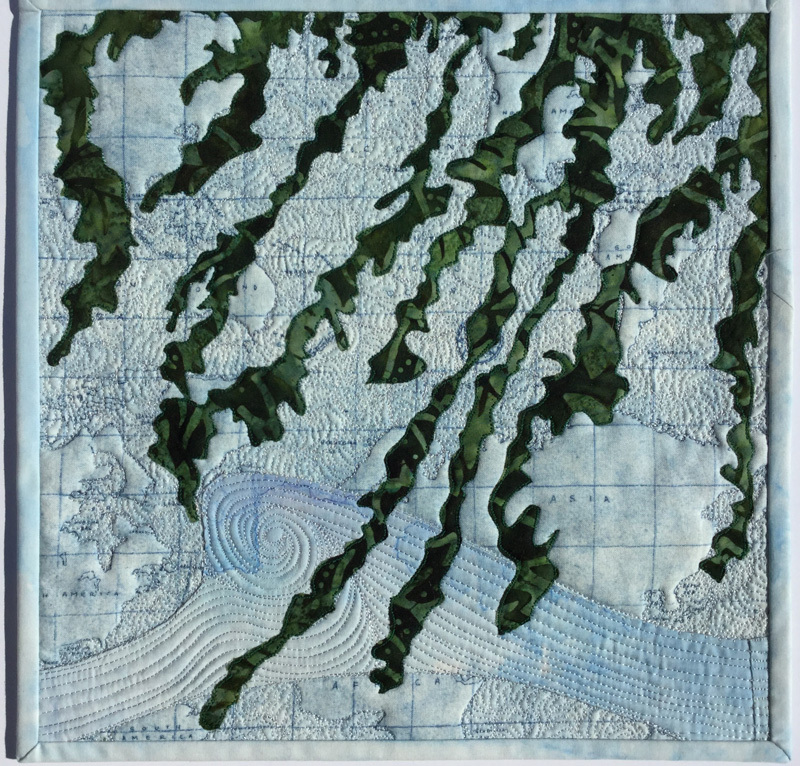 is Helene Blanchet's contribution to SAQA's 2019 Benefit Auction. The online bidding begins in mid-September. Stay tuned ! Live! 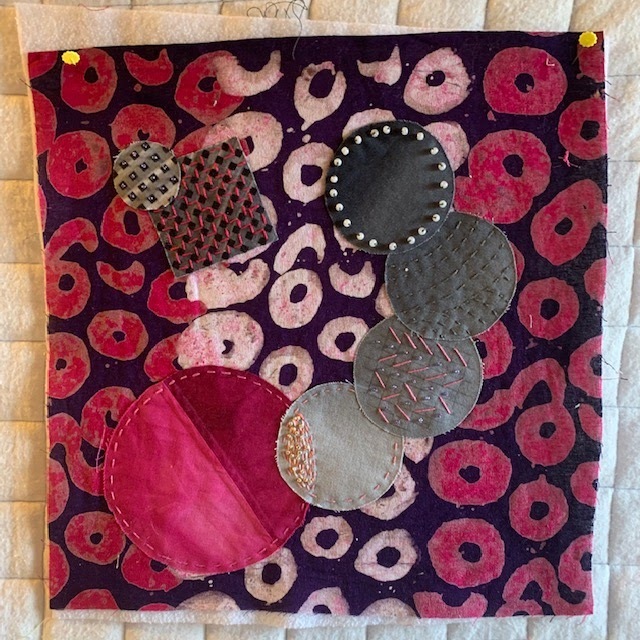 by Helene Blanchet (2018) 12" x 12"
Information about contributing to and purchasing art quilts from the 2019 SAQA Benefit Auction is available here. My studio vibrates with colour! I acquired a passion for tropical colours while growing up in Brazil. I discovered shibori when living in India and took up hand dyeing while living in South Africa. 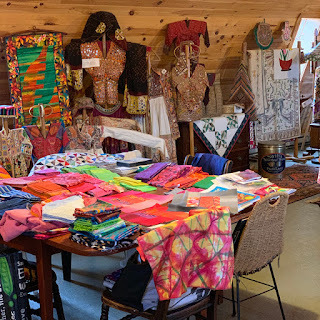 Also a result of my travels, my studio is a showcase for a collection of tribal textiles. I’ve had this studio for about ten years. It’s the second floor of our new-built barn and has an ocean view. The four skylights and four windows fill the space with light. I absolutely LOVE it. My fabrics and books are organized on shelves custom built by my husband, Bill. The fabrics are sorted by colour but also by type. For example, there’s a Kaffe Fasset and modern quilt fabrics shelf as well as a shelf for batiks and hand dyes and another for conversation fabrics etc. My "cutting table” is a modified saw table that once belonged to my father-in-law. For lighting, I have four large light fixtures hanging over strategic areas (work table, cutting table, reading and socializing area etc). I also have Ott Lites for worktables and as floor lamps. 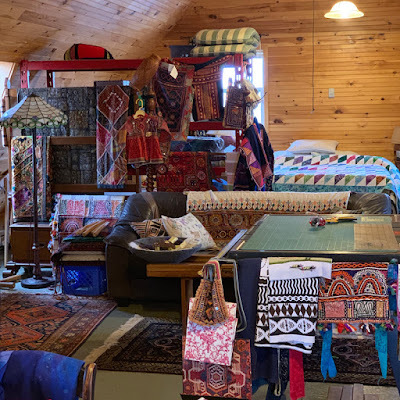 It’s a creative, messy space!! 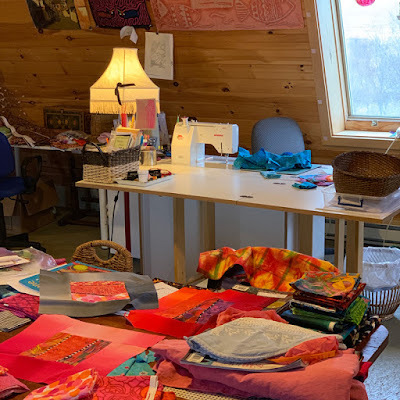 I have several work surfaces and two sewing machines so slowly projects and studio items just take over. But I don’t mind clutter and I always know where things are. My current favourite gadget is the Martelli Rotary Cutter, designed by a hand surgeon for his quilter wife. It is THE most ergonomic cutter I’ve ever used and great for cutting several layers of fabric. It did take a bit of getting used to though…. 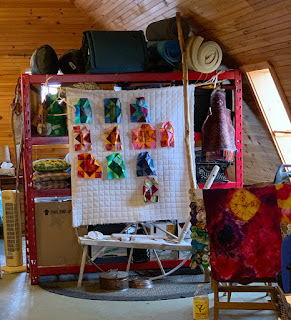 In my studio space I can teach or be on my own, listen to music as loudly as I want to and leave a creative mess behind. I can just sit there and admire interesting collectibles from around the world. I can meditate there and just be. When I’m having a thinking spell or trying to resolve a creative problem, just looking at my fabric stash feels very therapeutic! 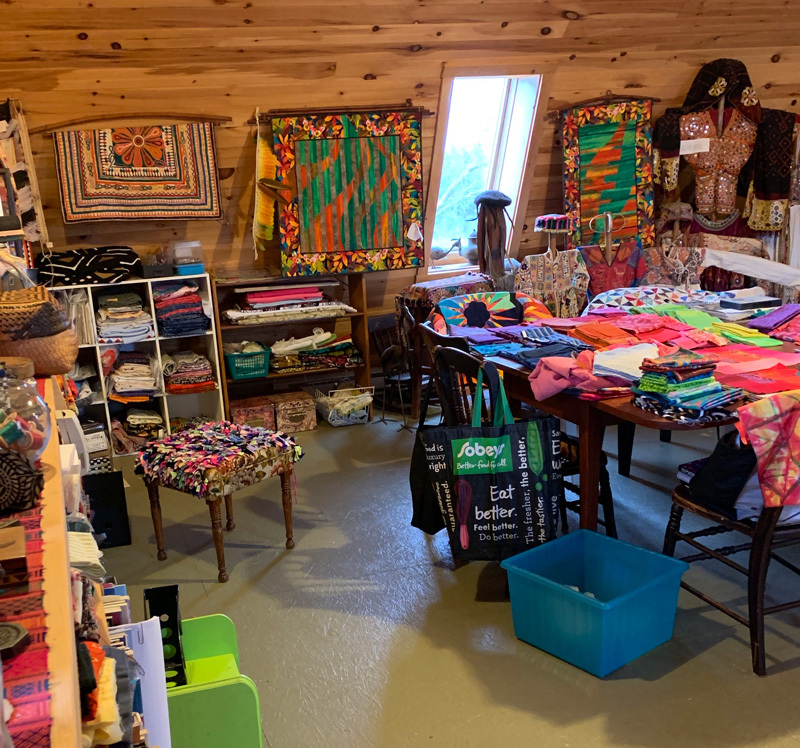 Congratulations to Regina Marzlin, of Antigonish NS, who recently got word that her 2019 Benefit Auction contribution was accepted into the special exhibit at the International Quilt Study Centre and Museum in Lincoln, Nebraska. Thirty pieces were selected for this exhibition, from the 130+ early entries. An online gallery of the 30 pieces can be seen on the SAQA site. Traces by Regina Marzlin (2019) 12"x 12"
Regina's piece, Traces, includes hand painted and commercial cotton, non-woven material, embroidery floss, ink pencil, monoprinting, painting, hand- and machine stitching. 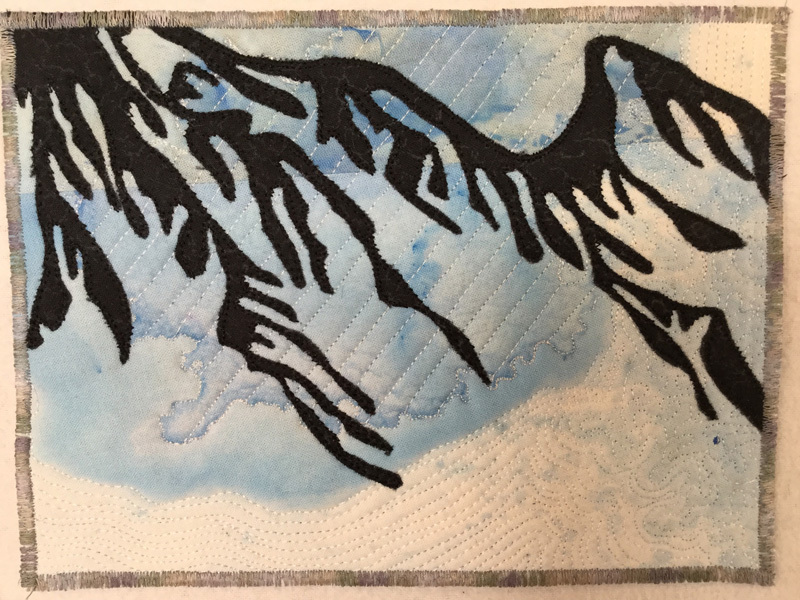 Results of World Wide Whispers, an international collaborative quilt challenge, were revealed at the Scottish Quilter’s Guild Show in Glasgow earlier this month. SAQA Atlantic member Kathy Tidswell represented New Brunswick on the Canada team, which was one of five country teams involved. Scotland, Ireland, the Netherlands and the USA each hosted their own World Wide Whispers challenge. The project was described as being similar to a child’s game where the leader whispers a sentence to the next person, who whispers it to the next, the sentence evolving and changing as it goes on. 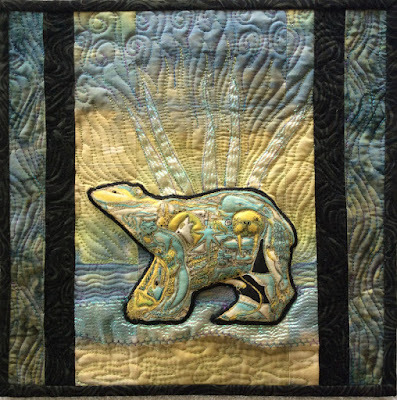 Team Canada leader Kim Caskey (Alberta) made the first quilt, inspired by a photograph by Lesley Zwaal of Edmonton Alberta. Thirteen artists, one from each province and territory of Canada, each in succession, were sent a photograph and statement of only the most recent piece. Each had one month to create an 18” x 24” piece of their own, inspired by the previous participant’s piece. 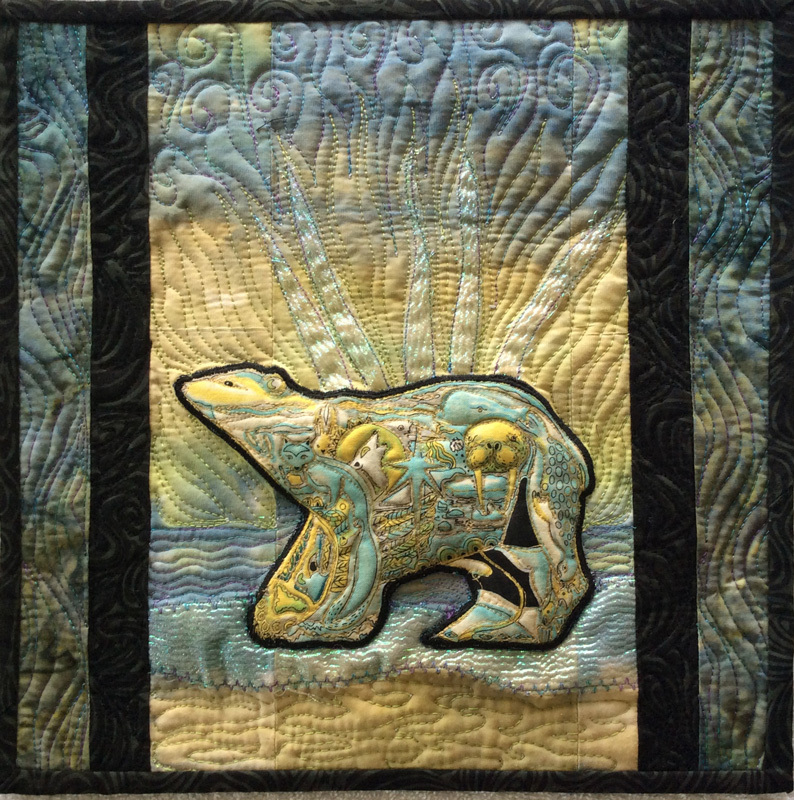 Kathy Tidswell: I created the third quilt in the series. It’s been a long 13 months when we were not allowed to reveal our involvement and saw only a photo of the quilt that inspired our piece. 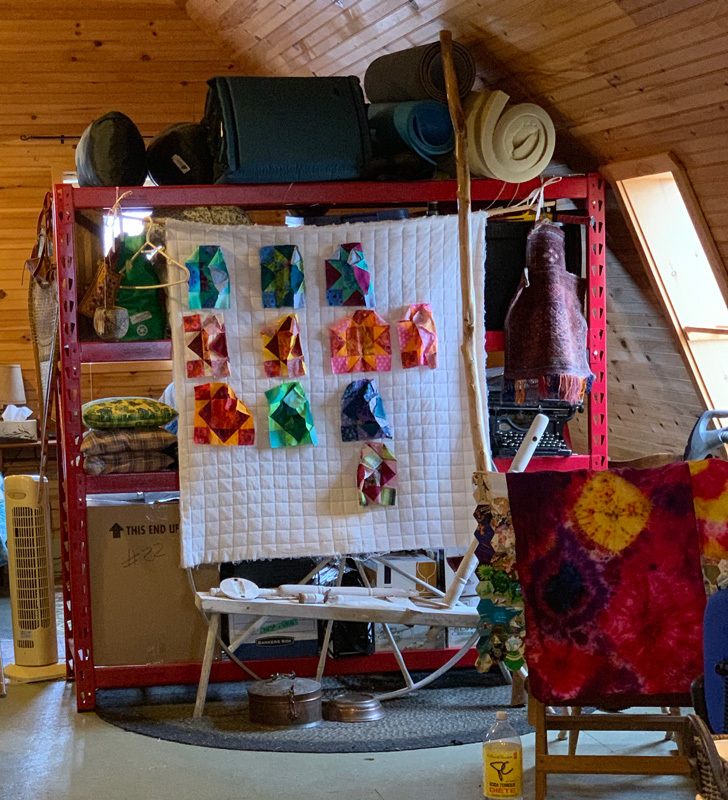 The Canadian collection was shipped to Scotland and now hangs with quilts from the other four teams at the Scotland Quilter’s Guild AGM in Glasgow. 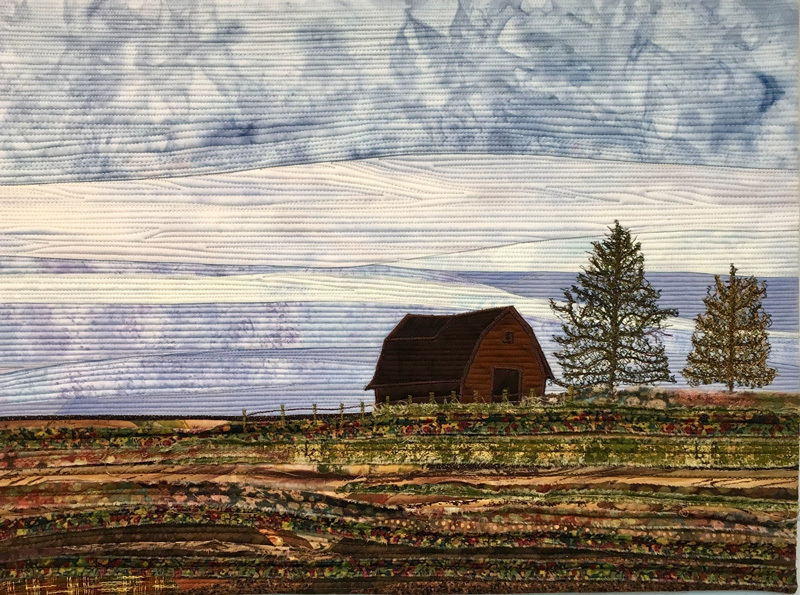 The entire collection will travel to The Netherlands for a show in April and will be at The Birmingham (UK) Festival of Quilts in August 2019. 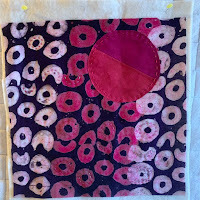 I plan to attend and will give two, one-hour demonstrations on using Inktense pencils to create appliqués, as part of the Quick and Easy Demonstrations series. 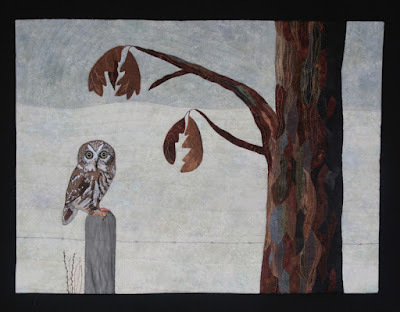 Drawing inspiration from Pat Findlay’s landscape and suggestions from my “idea generating” husband, I chose to feature my favourite little owl, a Saw Whet owl. Surveying his kingdom from a fence post, he stares out with that quizzical expression. What could he be thinking? Is he wondering why he hasn’t moved further south before the snow has come to New Brunswick? Watching over him is a stately oak tree clinging to a few remaining leaves. I love to create texture and dimension and if you look closely you will find it. 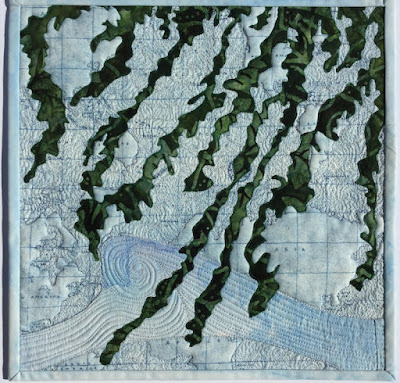 Karen Henry, an early member of SAQA Atlantic, represented Nova Scotia in the challenge and created the sixth piece in the Canadian series. At various points in our lives we feel anchored, adrift or in the process of letting go. Any of these three stages could be applied to our evolutions through aging, in creativity, in the growth of our offspring, in our education, moving from one physical space to another, etc. This wall hanging reflects the changing circumstances of our lives. 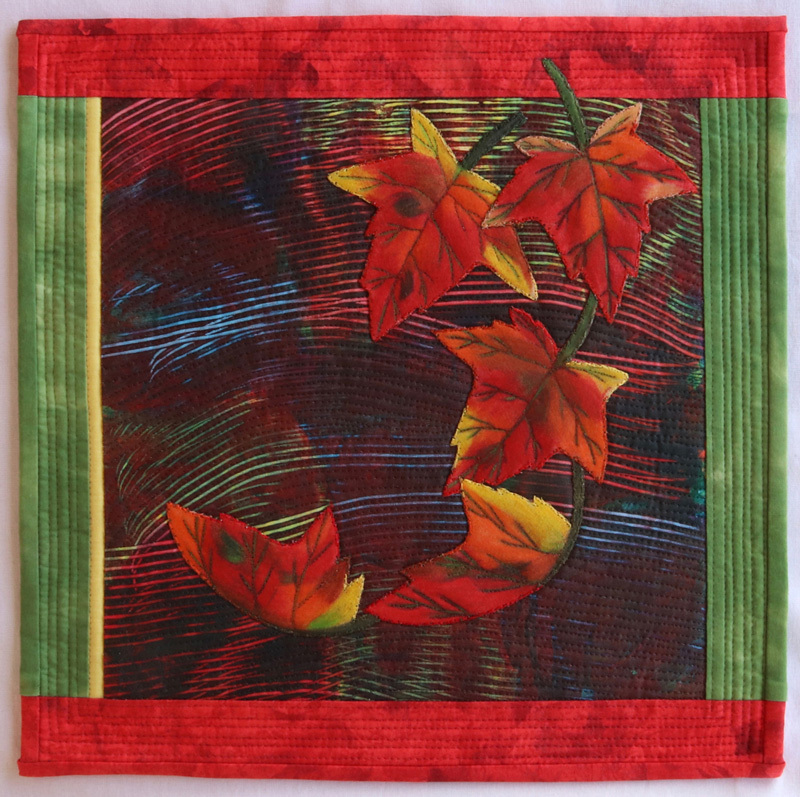 Autumn Breezes is Kathy Tidswell's contribution to SAQA's 2019 Benefit Auction. The bidding, on hundreds of fabulous art quilts, begins in mid-September. Stay tuned ! 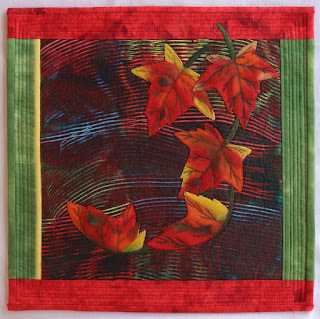 Autumn Breezes by Kathy Tidswell (2019) 12" x 12"
KT: Background painted using Colour Vie pigment system. Commercial fabric for borders. Leaves created using Inktense pencils. Free motion and walking foot machine quilted. 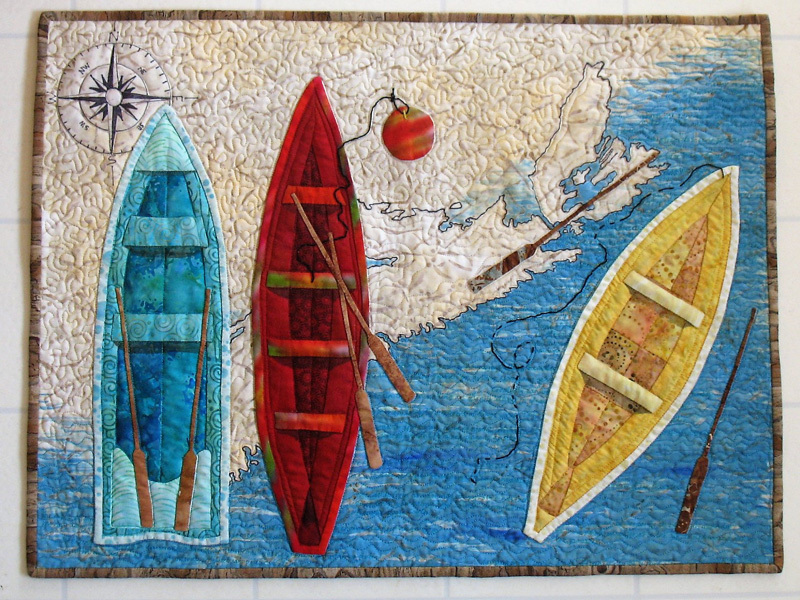 Deb Plestid, from Tatamagouche NS, recently donated two pieces to SAQA. Her piece Patience will be sold in the Spotlight Auction at the April 2019 SAQA conference. DP: Praise the stark beauty of a silhouette against a winter sky. Seemingly devoid of life, trees patiently, vigilantly wait for the warmth of spring. 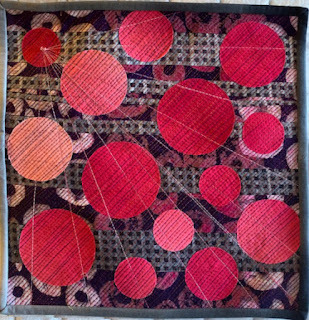 Deb Plestid also contributed Greening the Earth (below), which will be sold at the annual SAQA Benefit Auction, held online every September. Greening the Earth by Deb Plestid (2019) 12" x 12"
The deadline for submissions to the Spotlight Auction is now past. Information about the Spotlight Auction is available here. Fiona Oxford, of Waverley Nova Scotia, is the first of our artists to reveal her SAQA Benefit Auction piece. 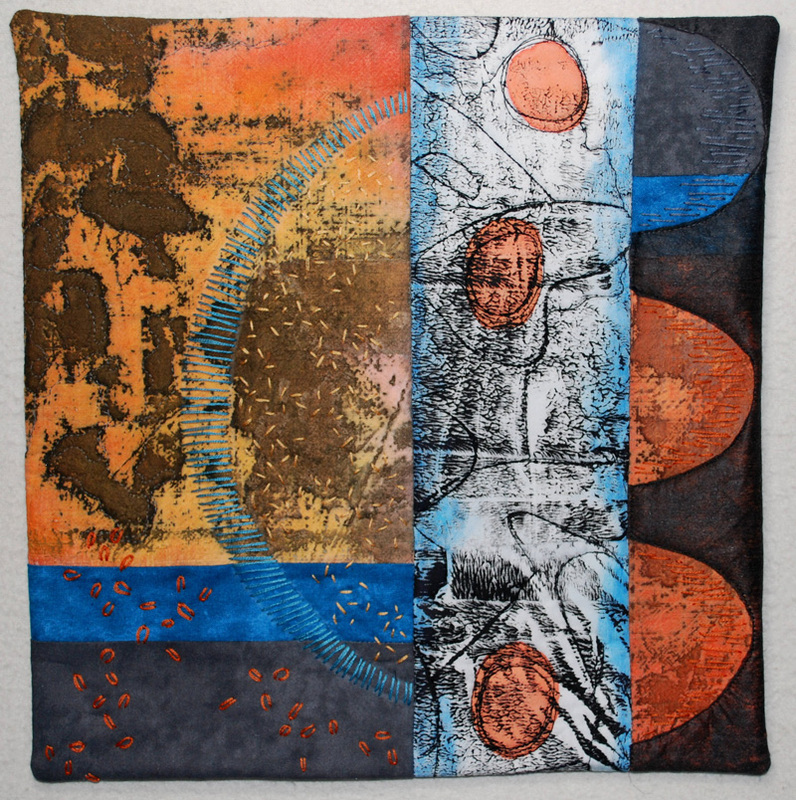 Skywatcher 3 by Fiona Oxford (2019) 12" x 12"
My piece, “Skywatcher 3”, represents my hope for a healthy planet. 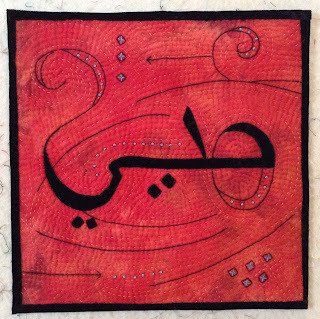 The annual benefit auction supports SAQA's exhibition and outreach programs. Almost $75,000 was raised in 2018 thanks to our generous artists and buyers! Contribute to the 2019 auction by donating a 12 x 12-inch art quilt. Final deadline to submit a piece is June 1. Details here. This year's auction will take place online from September 13th through October 6th. Interested in bidding? Auction details here. 2014 2015 2015 Grand National Quilt Show 2016 2017 2017 Grand National Quilt Show 2018 2019 area news Artist Facebook artist profile artist studio tour artist talk artist update artist website Atlantic Blogwatch awards blog calls for entry Current Work deadlines exhibiting work Exhibition of Work Exhibitions FAB Favorite Tools fund raising Grand National Quilt Show In memoriam In the News insurance member interview membership My Corner of the World New Brunswick Nova Scotia photography pricing published Recipe resources and suppliers retreat Retreat 2015 retreat 2016 SAQA SAQA Atlantic Regional Exhibition SAQA Atlantic Regional Representative SAQA Atlantic Retreat SAQA Benefit Auction SAQA Spotlight Auction Social Media Structures student work teaching tips Transitions trunk show Upcoming Classes Upcoming Workshops webinar Welcome to My studio What's My Favourite Material? What's my view? What’s My View? What’s on your wall?